Vor einem Jahr (Sommer 2016) haben wir uns an dieser Stelle das Ozochloch angeschaut (“Gute Nachrichten: Ozonloch auf dem Weg der Besserung“). Noch immer ist nicht in allen Details vollständig geklärt, wie sich das Loch öffnen und jetzt wieder langsam schließen konnte. Die FCKW spielen sicher eine Rolle. Zunächst einmal brauchen wir die aktuellen Zahlen. Wie hat sich die Fläche des Ozonlochs über dem Südpol in den letzten Jahren entwickelt? Die NOAA hat dazu in ihrem Climate Prediction Center eine gute Graphik (Abb. 1). Gut zu erkennen: Das Loch erreicht im September-Oktober typischerweise sein Maximum, also im Südwinter. Im Jahr 2017 entwickelte sich das Ozonloch zunächst genau wie im Durchschnitt der letzten 10 Jahre, verkleinerte sich dann aber ab Mitte September dramatisch. Aktuell ist das Loch kleiner als je zuvor in den letzten 10 Jahren. Abb. 1: Entwicklung der Fläche des Ozonlochs in den letzten Jahren (2017=rot, 2016=blau, 2015=grün). Quelle: NOAA. Abb. 2: Entwicklung der Ozonlochfläche im Südwinter (oben) sowie der Minimum-Ozonkonzentration (unten). Quelle: NASA. In this study, we provide a new perspective on the current state of the ozone layer using a comprehensive long-term total ozone data record which has been recently released within the framework of the European Space Agency’s Climate Change Initiative. Based on a multivariate regression analysis, we disentangle various aspects of ozone change and variability on global and regional scales, thus enabling the monitoring of the effectiveness of the Montreal Protocol. Given dominant natural variability the expected midlatitude onset of ozone recovery is still not significant and would need additional 5 years of observations to be unequivocally detectable. A regional increase in the tropics is a likely manifestation of a long-term change in El Niño–Southern Oscillation intensity over the last two decades induced by strong El Niño in 1997/1998 and strong La Niña in 2010/2011. Recent increases in an unregulated ozone-depleting substance, could delay recovery of Antarctic ozone levels by 5–30 years, depending on emissions scenarios.The findings, published in Nature Communications, suggest that a previously ignored chemical called dichloromethane may now be contributing to ozone depletion and should be considered to improve future ozone predictions. Long-lived chlorine species, such as chlorofluorocarbons (CFCs), led to depletion of the stratospheric ozone layer in the 1980s, most drastically seen in the Antarctic. 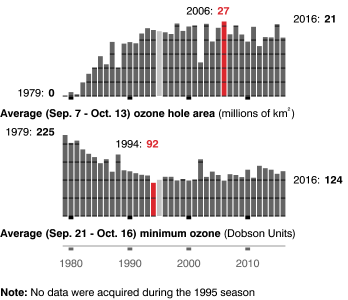 After introduction of the UN Montreal protocol in 1987, which regulated emissions of ozone-depleting substances, stratospheric ozone began to recover and is projected to return to pre-1980 levels in the second-half of this century. The Antarctic ‘ozone hole’ is expected to fully recover sometime between 2046 and 2057. “While ozone depletion from dichloromethane is currently quite modest, it is uncertain how the amount of this gas in the atmosphere will change in the future. Our results show that continued sustained growth in its concentration could substantially delay recovery of the ozone layer, offsetting some of the future benefits of the Montreal Protocol.” Dr Ryan Hossaini of Lancaster University and colleagues use simulations with a global chemical transport model to examine the sensitivity of future stratospheric chlorine and ozone levels to sustained dichloromethane growth. Measurements of dichloromethane in the atmosphere over the past two decades, provided by scientists from the National Oceanic and Atmospheric Administration (NOAA) in the United States, were also analysed. It is available online here http://www.nature.com/naturecommunications. The next major volcanic eruption could kick-start chemical reactions that would seriously damage the planet’s already besieged ozone layer. The extent of damage to the ozone layer that results from a large, explosive eruption depends on complex atmospheric chemistry, including the levels of human-made emissions in the atmosphere. Using sophisticated chemical modeling, researchers from Harvard University and the University of Maryland explored what would happen to the ozone layer in response to large-scale volcanic eruptions over the remainder of this century and in several different greenhouse gas emission scenarios. The research was published recently in Geophysical Research Letters. Earth’s stratosphere is still recovering from the historic release of chlorofluorocarbons (CFCs) and other ozone-depleting chemicals. Even though CFCs were phased out by the Montreal Protocol 30 years ago, levels of chlorine-containing molecules in the atmosphere are still elevated. Explosive volcanic eruptions that inject large quantities of sulfur dioxide into the stratosphere facilitate the chemical conversion of chlorine into more reactive forms that destroy ozone. Researchers have long known that when concentrations of chlorine from human-produced CFCs are high, ozone depletion will result following a volcanic eruption. When levels of chlorine from CFCs are low, volcanic eruptions can actually increase the thickness of the ozone layer. But exactly when this transition happens — from eruptions that deplete ozone to eruptions that increase ozone layer thickness — has long been uncertain. Previous research has put the window of the transition anywhere between 2015 to 2040. The Harvard researchers found that volcanic eruptions could result in ozone depletion until 2070 or beyond, despite declining concentrations of human-made CFCs. “Our model results show that the vulnerability of the ozone column to large volcanic eruptions will likely continue late in to the 21st century, significantly later than previous estimates,” said David Wilmouth, who directed the research and is a project scientist at the Harvard John A. Paulson School of Engineering and Applied Sciences and the Department of Chemistry and Chemical Biology. So, why is this shift happening so much later than previously thought? “Previous estimates did not take into account certain natural sources of halogen gases, such as very-short lived bromocarbons originating from marine plankton and microalgae,” said Eric Klobas, lead author and Harvard chemical physics PhD candidate. The researchers then explored how a volcanic event the size of the Mount Pinatubo eruption, which shot about 20 million metric tons of sulfur dioxide into the stratosphere in 1991, would impact the ozone layer in 2100. The team modeled four different greenhouse gas emission scenarios, ranging from very optimistic to what is commonly considered the worst-case scenario. The team found that the most optimistic projection of future greenhouse gas concentrations resulted in the most ozone depletion from a volcanic eruption. Conversely, in the pessimistic scenario in which greenhouse gas emissions continue to increase rapidly throughout the 21st century, a Mount Pinatubo-size eruption would actually lead to a slight increase in ozone. The researchers found that the colder stratospheric temperatures and higher methane levels in this scenario would curb important ozone-depleting chemical reactions. But, here’s the kicker: all of the above scenarios assumed that the volcanic eruption would only inject sulfur into the stratosphere, like the 1991 eruption of Mount Pinatubo in the Philippines. If the eruption were to also inject halogen-containing chemicals such as hydrogen chloride (HCl) into the stratosphere, the results could be dire. “If volcanic halogens, which are commonly present in large quantities in volcanic eruptions, were to partition substantially into the stratosphere — in any greenhouse gas emission scenario, at any point in the future — it would potentially cause severe losses of stratospheric ozone,” said Klobas. In such a case, the United States could see a prolonged and significant decrease in ozone layer thickness — upwards of 15 to 25 percent in the highest halogen scenario modeled. Even small reductions in the thickness of the ozone layer, which shields the surface of the Earth from DNA-destroying ultraviolet radiation, can adversely impact human health and other life on this planet. “These eruptions are highly unusual events but the possibility does exist, as evidenced in the historical record,” said Wilmouth. Since the discovery of the Antarctic ozone hole, scientists, policymakers, and the public have wondered whether we might someday see a similarly extreme depletion of ozone over the Arctic. But a new MIT study finds some cause for optimism: Ozone levels in the Arctic haven’t yet sunk to the extreme lows seen in Antarctica, in part because international efforts to limit ozone-depleting chemicals have been successful. “While there is certainly some depletion of Arctic ozone, the extremes of Antarctica so far are very different from what we find in the Arctic, even in the coldest years,” says Susan Solomon, the Ellen Swallow Richards Professor of Atmospheric Chemistry and Climate Science at MIT, and lead author of a paper published this week in the Proceedings of the National Academy of Sciences. Frigid temperatures can spur ozone loss because they create prime conditions for the formation of polar stratospheric clouds. When sunlight hits these clouds, it sparks a reaction between chlorine from chlorofluorocarbons (CFCs), human-made chemicals once used for refrigerants, foam blowing, and other applications — ultimately destroying ozone. After the ozone-attacking properties of CFCs were discovered in the 1980s, countries across the world agreed to phase out their use as part of the 1987 Montreal Protocol treaty. While CFCs are no longer in use, those emitted years ago remain in the atmosphere. As a result, atmospheric concentrations have peaked and are now slowly declining, but it will be several decades before CFCs are totally eliminated from the environment — meaning there is still some risk of ozone depletion caused by CFCs. “It’s really a success story of science and policy, where the right things were done just in time to avoid broader environmental damage,” says Solomon, who made some of the first measurements in Antarctica that pointed toward CFCs as the primary cause of the ozone hole. To obtain their findings, the researchers used balloon and satellite data from the heart of the ozone layer over both polar regions. They found that Arctic ozone levels did drop significantly during an extended period of unusual cold in the spring of 2011. 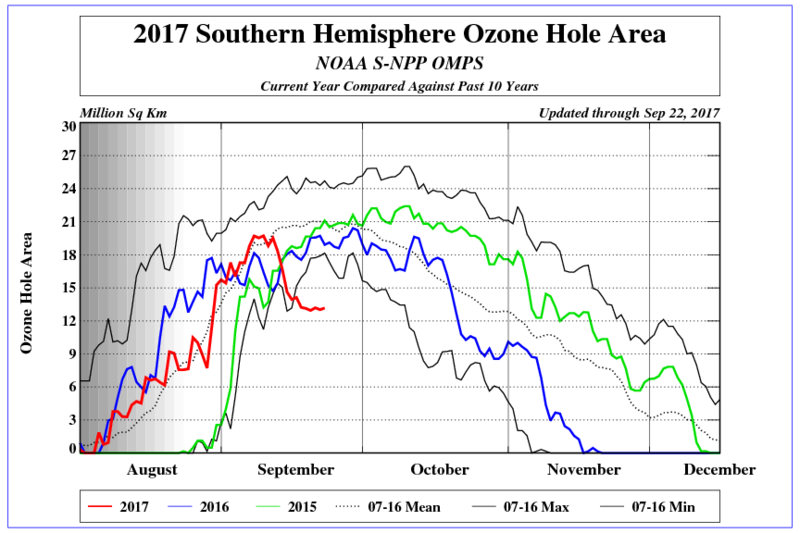 While this dip did depress ozone levels, the decrease was nowhere near as drastic as the nearly complete loss of ozone in the heart of the layer seen in many years in Antarctica. The MIT team’s work also helps to show chemical reasons for the differences, demonstrating that ozone loss in Antarctica is closely associated with reduced levels of nitric acid in air that is colder than that in the Arctic. The paper is the first to use observational evidence to confirm the chemical processes in polar stratospheric clouds that lead to ozone loss, says Brian Toon, a professor of atmospheric and oceanic sciences at the University of Colorado at Boulder and an expert on stratospheric ozone loss. Previous studies have used computer models or theories to explain the connection between nitric acid in these clouds and ozone depletion.